Paul Tisdale has not ruled out a shot at the League 2 title with eight games remaining. 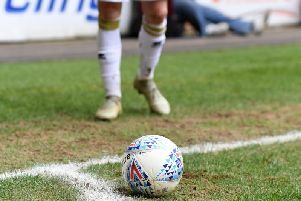 Dons sit fourth in League 2, a point outside the automatic promotion spots and 10 adrift of current leaders Lincoln City, who visit Stadium MK next month. Now at the business end of the season, Tisdale admitted he is disappointed to be sitting fourth, even if his expectations at the start of the season were different. "I'm not happy with fourth, we want to be third, second or first," he said. "At the start of the season, we had different expectations. There are eight games to go. I'm not prepared to concede anything. You'll have seen plenty of league campaigns with very unusual, exciting finales. With eight games to go, we cannot concede it (to Lincoln) but we will look at results and know what we'd prefer to happen. "We're at that point in the season now, where we stop talking just about our own performances and start looking at others, working out points. Today is that day. I'd be lying if I told you we weren't looking at other results, and hoping one team beats another. We're there. It's mid-March and we're ready to go." Captain Dean Lewington said there is an air of frustration in the dressing room after several points were left on the road - notably against Northampton and promotion rivals Bury - that could have seen Dons in a much better season. He said: "The most disappointing thing this season is that if you ended games with 10 minutes to go, we'd probably already be promoted. It's hugely frustrating. It's good motivation not to let it happen again, and to know when we're playing well, we can get into position to win games. "We're as focused as we can be. We're into the final stretch now, and it's looking like four into three now. Every game will count, and we're into the final countdown. We're very determined to get the job done now.